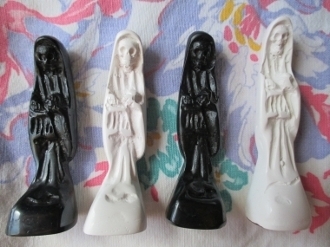 This listing is for a 3 inch resin statue, in white, with my Original Santa Muerte oil. The bottom is clear and filled with lucky curios such as crab seed, golden lucky amulets, grain, pyrite, lucky green rice, etc. as is the traditional way to create these statues. She hold a set of scales,a crystal ball and an owl is seated at her feet as a symbol of wisdom.